Every time the movie “Forest Gump” is on television, do you instinctively want to watch it? Many of us share that same feeling. Forest Gump is pure movie magic, bristling with life lessons and inspiring anecdotes that deal with love, laughter, mortality, fear, and the uncertainty of tomorrow. 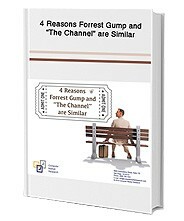 Receive a Free whitepaper on “4 Reasons Forrest Gump and “The Channel” are Similar” by filling out the form on the right.